The development of the city can be seen by the scenario of roads that the city is offering with and it is pity clear that the city has given much beautiful building in the past few years. 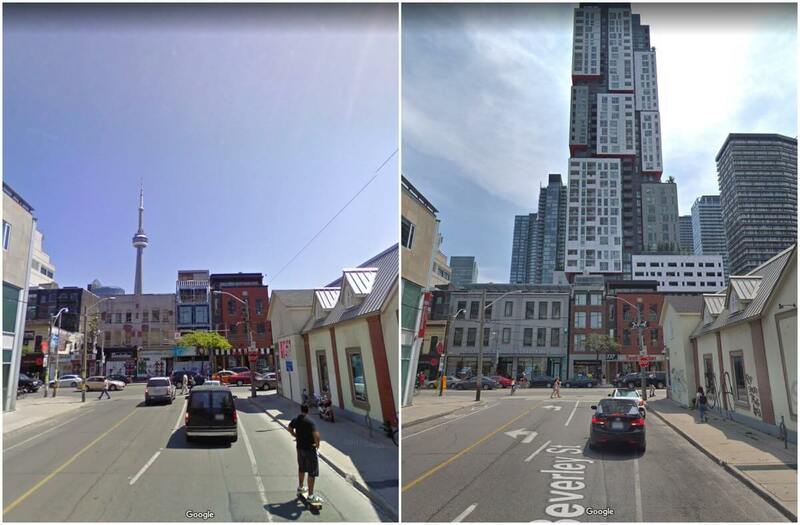 Although the CN Tower was there in 2009 as well the catch here in 2018 is that now you cannot see the tower clearly the huge tower has been covered with a condo. The condo is basically a smaller sized apartment which is very new of the society and not even made everywhere, it is sort of independent apartment which is often termed as real estate and this kind of construction is a sign of modernization as well as technologically advancement. The city is growing in population which can clearly be seen through the dense construction of buildings that you would rarely get any free space. 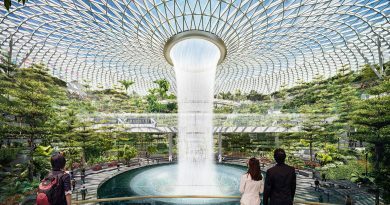 It is true that the building, as well as other constructions for the living, is slowly killing the nature but no one can actually help it because a growing population definitely needs some space to settle in. The city is definitely growing larger and developing as well which is a matter of pride for all the local residents of the place. In the left picture which is taken 10 years back has space around and roads where also much wider but the picture that is taken in 2018 describes a completely different scenario which is a sign of development for sure that the city has gone through in the past 10 years and the change is appreciable. The pattern of the road has changed a lot from what it was years back and many road safety as well as traffic oriented things are added which ensures that the traffic rule in not violated and traffic could go on with ease and no one could have to face rush in this way. 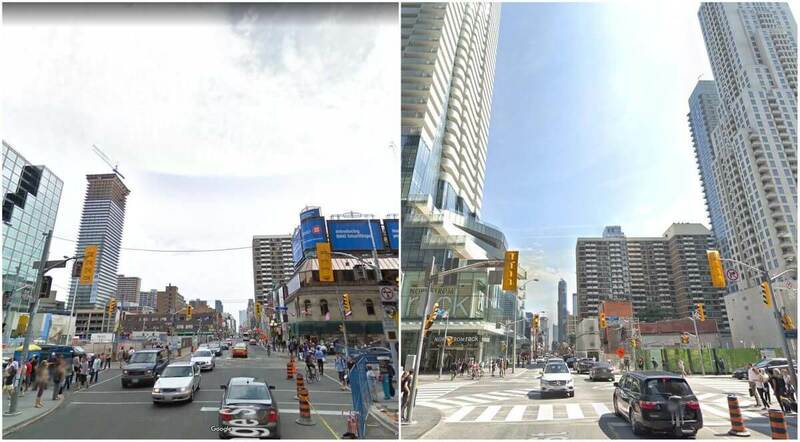 Many tall constructions have taken place and showed up in 2018 such as the one as well as one Bloor west although these constructions were not in 2009 stollerys was there in 2009 and in the present day, the construction has been accompanied by many other great as well as tall buildings. By the picture was taken in 2018 it can be seen that many old constructions have been renewed entirely and many old constructions have been completely destroyed and in that place, new construction took place which is amazing to see. In the picture that is at the left side is taken 10 years back clearly shows up some wonderful buildings but in 2018 the picture is a bit different and the great thing is that many more buildings were added here to accompany the buildings of 2009 many more building where constructed and thus the scenario of 2018 is quite compact as well as full with less open space and more of established modern buildings. Many tall buildings are also constructed to make the city look stunning and it is for sure that the city now looks technologically advanced and stunning as well. You can check many more such changes in this or many more other cities at architectures ideas. 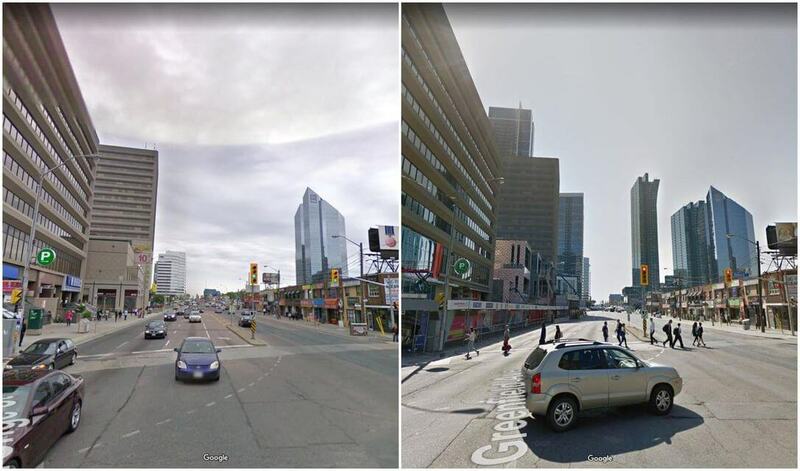 These were some of the great as well as the visible difference of Toronto city that it showed in the 10yearchellenge buildings.